📅 December 2016 March 17, 2019 by Bruno B. This Ninh Binh travel guide has all you need to know to plan your trip to one of the most fascinating places in Vietnam. Don’t miss it! It boasts of the most majestic and impressive natural landscapes in Southeast Asia, yet so many travelers overlook it. This travel guide of Ninh Binh is packed with the most up-to-date and reliable information to plan your trip and start making your itinerary. Let’s start! Prepare to feel like you are in a National Geographic documentary ALL THE TIME. 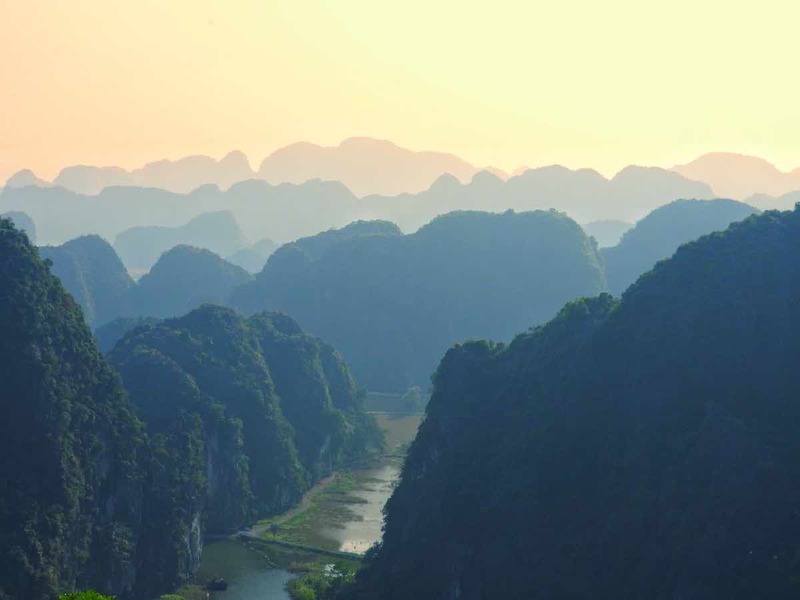 Is Ninh Binh worth it? First things first. If you’re still in doubt if you should go to Ninh Binh or not, my answer is YES. DEFINITELY YES. Now I can’t believe I was considering dropping Ninh Binh from my trip and it’s my #1 suggestion for anyone who’s going to Vietnam soon. Since Ninh Binh is not frequently featured in itineraries to travel through Vietnam, I feel I need to explain why this was my absolute favorite destination in the country. Ninh Binh province is located in northern Vietnam, about 100km south of Hanoi. With its hundreds of limestone cliffs emerging from the ground scattered across the rice fields, this region is appropriately nicknamed the “Halong Bay in land”. 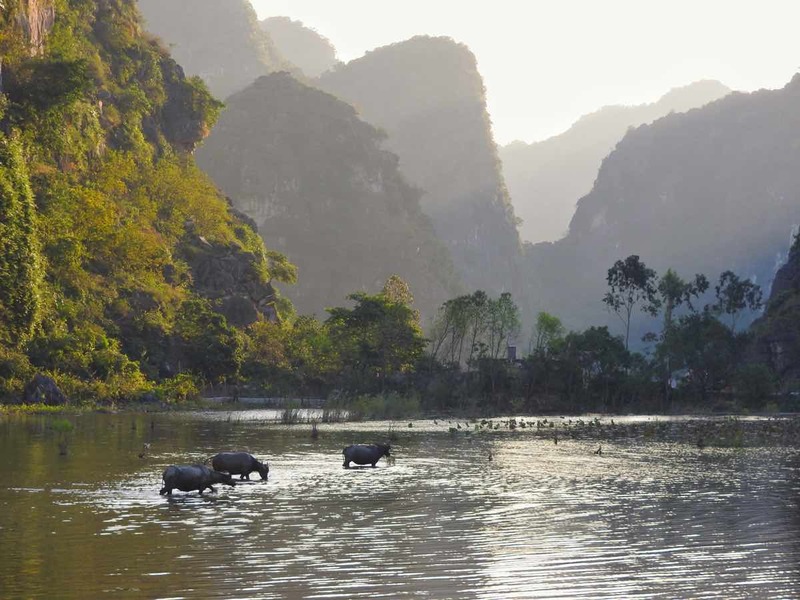 Apart from this stunning scenery, Ninh Binh is a great opportunity to peek into the rural way of living. It’s all very laid-back and serene, just how the Vietnam experience should be. From Hanoi, you can reach Ninh Binh city by train. There are at least 3 southbound trains available (SE5, SE7, SE19). A more convenient option is the bus. There are regular buses from Hanoi’s southern bus terminal (Giap Bat) with prices starting at 70,000 dong. However I don’t recommend getting the absolute cheapest ones – you might get cranked in a tiny seat inside an overcrowded bus. UPDATE: a reader has reported these buses are no longer in operation. Do your research. Both the train and the bus take 2 hours, give or take, and you can book the trip with any travel agent. If you’re coming from the south, you also have both the train and bus options. 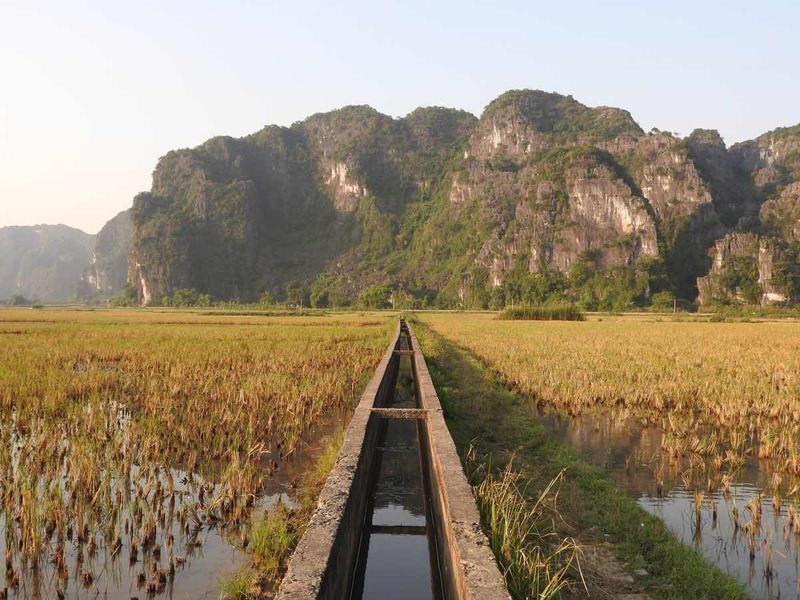 The train going to Hanoi from Hue stops in Ninh Binh so shouldn’t be too hard to get into one. There are buses going to Ninh Binh directly from Halong Bay or Cat Ba. It’s very convenient as it allows you go to both areas without having to pass through Hanoi. There is a bus from Bay Chay station (Xe Be Bay Chay) that goes to Ninh Binh – check my experience below. Make sure you ask where does the bus stops, as there will be buses heading to Ninh Binh town and others to Tam Coc (7km away). The latter stop in front of The Long Hotel. To get to Ninh Binh I came directly from my cruise in Halong Bay. I pre-booked a ticket which included a taxi to the Bay Chay station and then a bus from there to Ninh Binh. What it was supposed to be 4 hour-trip ended up taking 6 long hours and I could use a bit more leg space. Other than that, all good. A good travel agent can go through all the possible options with you and check what is the best. Usually it’s worth the extra commission, just ask away all the questions you have! Average temperatures in Ninh Binh throughout the year. Note this is for the city. In more remote areas, the temperatures can be a bit more extreme. Almost any time of the year is good to visit Ninh Binh. Like in all the north Vietnam, May to October in Ninh Binh is hot, humid and with high rainfall. The region can be specially vulnerable to typhoons during September. November to April months tend to be cooler and dry. However, the rainy season is also when the rice fields are at their best vivid green, so there’s really a reason to visit all year round! In the dry season, the rice fields turn gold. I was in Ninh Binh in late November and it didn’t feel busy at all which was a blessing. Exploring such a laid-back place with crowds everywhere must be frustrating. The only drawback of this time were the paddy fields. Most of the rice is harvested in September, by November all that is left are yellow-ish – and many times brown muddy – fields. It does take away a bit of the beauty, but the sights are still impressive. As for the weather, we had mostly sunny days during all our time there. However, temperatures were not so high (around 20C). The evenings were quite chilly and it was the only time on my 2-month backpacking trip I had to wear long sleeves. Bai Dinh Pagoda at dusk. Ninh Binh is one of those places you absolutely need to get your own transport. Otherwise you’ll miss out tremendously. In fact, one of the highlights of the place was to make my way through the rice fields on a motorbike with the wind in my face. It’s hands down the best way to explore the surroundings. You can rent it from 100k dong/day from hotels or travel agents. The other option is to rent a bike. Almost all the region is pretty much flat and the roads – both the main and secondary – are in decent conditions (don’t expect luxury though). Biking is a great option to get around Tam Coc – we actually did this on the last day. However, if you want to cover all main sites prepare to cover around 30km per day. Places like Bai Dinh Pagoda or even Trang An can be just too far away. In any case, make sure you leave the main roads and travel between places along the more authentic country lanes. The city of Ninh Binh itself is not pretty and there’s basically NOTHING to see there. Two strong reasons to find accommodation elsewhere. All major attractions are outside, concentrated in four different areas. I’ll go through some of these in detail. Leaving a cave in Trang An. This was the first thing I did in Ninh Binh and turned out to be one of my favorite things of the whole trip. You basically hop on a small rowing boat and a lady rower takes you on a 2-hour journey through caves, temples and lakes. They usually wait for a group of four to assemble. The technique needed to maneuver the boat inside the underwater caves is impressive , watch your head! During the whole trip, the scenery is mesmerizing. 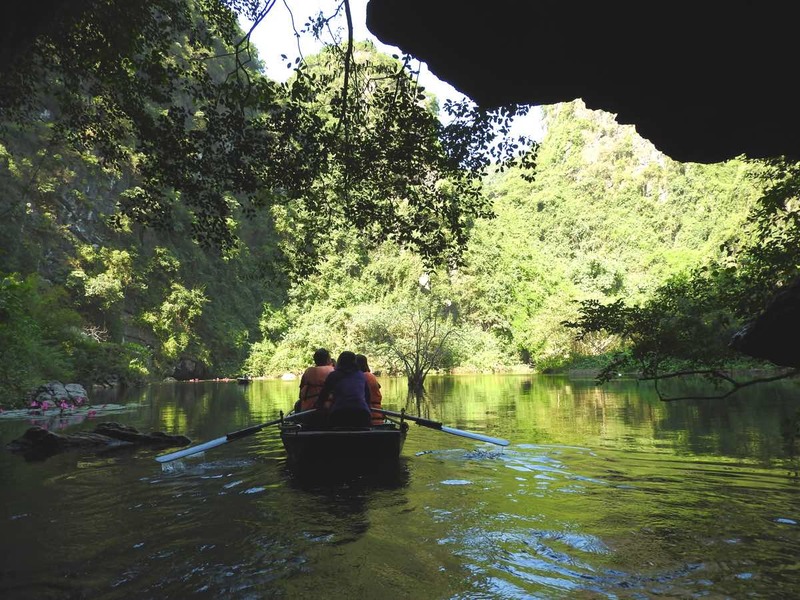 Trang An is usually the second choice of travelers in Ninh Binh in terms of boat rides. Most people do Tam Coc only (HUGE mistake in my opinion, see below why) so you can expect fewer crowds. Still, it’s advisable that you make your way there early in the morning or late in the afternoon where most day trippers coming in gigantic bus excursions are not there. Trang An is 7km away from Ninh Binh and about 11km from Tam Coc. At first we were relying on Google Maps to get to this place and we struggled. Tip: search for the Vietnamese name, Khu du lich sinh thái Tràng An, it will pin the right spot. Entrance fee is 150,000 dong (as per December 2016). You pay the ticket at the entrance and you’re not forced to do any extra tips or payments to the rower. There is however a parking fee of 15,000 dong for two wheelers (bicycle or motorbike). Just renting a motorbike and explore the surroundings is already a reason to visit Ninh Binh. What we did was to look in the map where the next sight was and choose a longer and more unconventional way to get there. By skipping the main roads, you’re on to enrich your travel experience much more! Wander through the tiny paths in the rice fields or the dirt roads leading to local communities and villages. Ninh Binh is one of those places where the children wave and say “Hello” to you when you pass in front of their houses. It’s fascinating to see where people live, how do they work on the fields and how do they spend their day. As a bonus, there are loads of cute animals too! Scattered across the rice fields, enclosed in mountains on sitting on top of them, there is no shortage of temples in Ninh Binh. Perhaps the most dramatic is Hang Mua. Sitting on top of hill 500 steps above ground, this temple is both a challenge and a delight. While the temple is somewhat unimpressive, the views over Tam Coc are stunning. 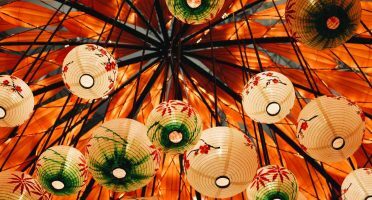 If you’re looking for something less challenging, but equally impressive, the recently built Bai Dinh Pagoda is a good option. This Buddhist temple is HUGE and is mostly visited by Vietnamese people. But there are more. Bích Động Pagoda is a set of 3 temples carved into a limestone mountain next to Tam Coc. 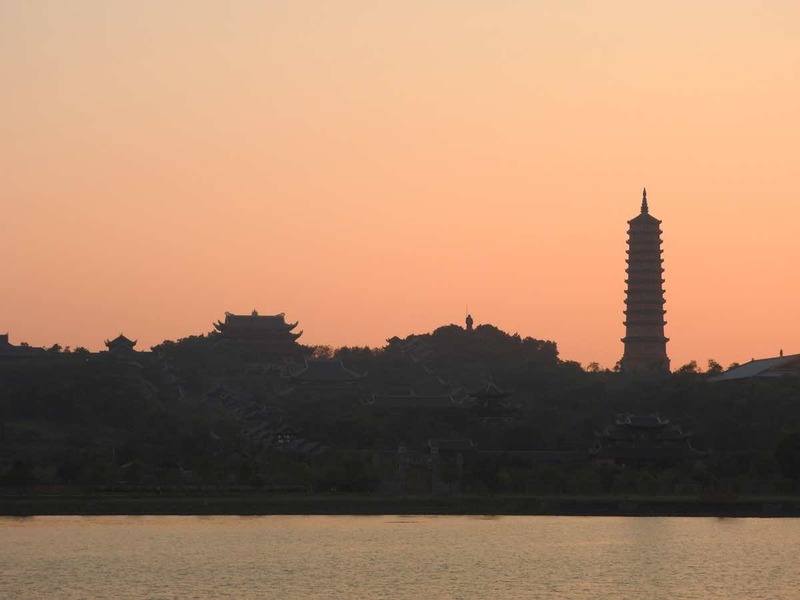 Despite the fact it has been heavily destroyed, the ancient city of Hoa Lu, the former capital of Vietnam during the Dinh and the Le dynasties (1st century), is also worth a visit. Hang Mua: there is a 100,000 dong entrance fee and a 3,000 dong bicycle/motorbike parking fee. Bai Dinh Pagoda: free if you walk; 50,000 dong if you opt to get around with the electric car. Bích Động Pagoda: free entrance but there is a 20,000 dong bicycle/motorbike parking fee. We only heard this place when our lovely friend who worked as a receptionist on our hotel mentioned it. She actually took us there and offered to be our guide. Thanks so much Trang! The park also has several caves and hiking trails and is perfect for take a bit of fresh air and go on a relaxing walk. It’s just 5km from Tam Coc center. Cuc Phong is a rare well-preserved rainforest. The place is known for its Botanical Garden and the Endangered Primates Rescue Centre, which has around 150 primates from all over Vietnam. It’s a great place for biking, hiking and observe a wild range of animals, from birds to an amazing variety of colorful butterflies. The National Park sits 45km from Ninh Binh and there is a mandatory 20,000 dong fee to hire a guide. It might tempting to do the Tam Coc boat ride if you’re going in the rainy season when everything’s vibrant green. I understand. However I did skip the most hyped attraction in the Ninh Binh region. Here’s 3 reasons why. #1 – it’s a frequent scam spot, it’s full of hawkers. After you a pay the ticket, rowers will stop rowing if you don’t give them an additional tip. When you’re finished with your ride, other people in shore will try to make you buy “food” for the rower. #2 – the general feeling is that the ride is not as beautiful as Trang An‘s. Having done that one first, I would more likely be underwhelmed anyway. #3 – you can still ride a bike along the fields and do your own tour. First rule is allow yourself at least 2 full days in Ninh Binh. Most travelers come here on a day trip from Hanoi which it’s a shame. You can’t even scratch the surface of how beautiful this place is in only a few hours in the most packed touristy places. Second rule is to skip staying in Ninh Binh city. I can’t understand how people come to such a nature-gifted place and stay in an uninspiring and ugly city. Instead, base yourself in Tam Coc, in the countryside. 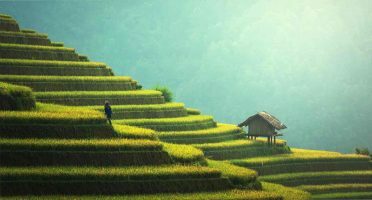 It’s a small town closer to the main attractions – including the rice fields – and there you can experience the rural side of Vietnam. The only downside from the place we stayed (below) was the location: 2,5km from Tam Coc center, with all the shops and restaurants. On the other hand, we had a quieter location with much better views! I usually use Booking.com to find accommodations. 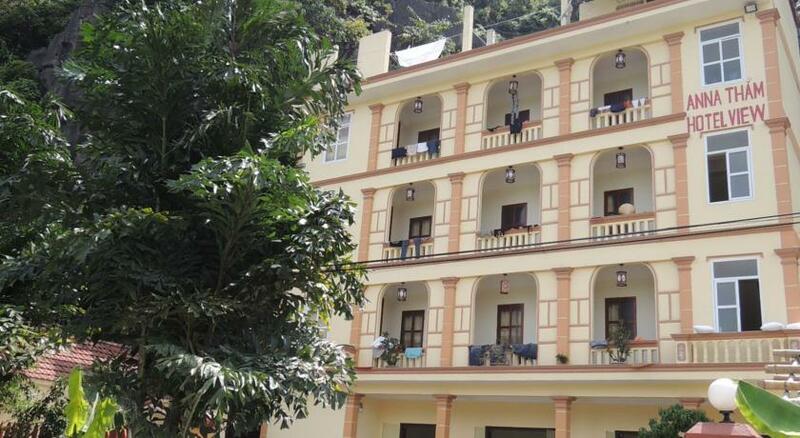 It’s safe, easy and reliable and you can use my shortlist of the top-rated places to stay in Ninh Binh with WiFi included. I personally think food in Vietnam is one of the best I’ve tasted. And for cheap prices, which makes it great value! Specifically in Ninh Binh, the specialty are goat (con dê) dishes. As I stayed in Tam Coc, I made most of my meals there. Here are some of the the best places to eat. This hotel is run by a lovely family and also has a restaurant in their garden. I’ve actually tried to book my stay here but they were completely full. The setting is lovely and despite being in the heart of Tam Coc town, it feels like a getaway. Interesting combination of Vietnamese and western dishes. Located right next to the boat area in Tam Coc, this small place is a favorite amongst backpackers (me included!). The prices are amongst the low you can find and food is good. Safe bet to eat. I found the prices in Ninh Binh to be a bit lower than in big cities like Ho Chi Minh or Hanoi. You can easily get around with less than 40EUR/USD per day. To give you a good idea of the budget you can expect, I’ll give you some examples of what things can cost. Vehicle rentals: motorbikes in Tam Coc can be rented from 100,000 dong/day. Bikes for half that price. Food: Local restaurants served main dishes starting at 150,000 dong. A bowl of pho (noodle soup) starts at 40,000 dong though. A Tiger beer started at 25,000 dong. Water: don’t forget to hydrate. A big water bottle (1,5L) was around 25,000 dong. Entrance fees: entrance to the temples was generally 50,000 dong. The boat ride in Trang An was 150,000 dong, but in Tam Coc is 180,000 dong. Accommodation: I’d say you can expect to pay somewhere between 500,000 and 800,000 dong for day for a medium-quality double room in most places. Of course there are backpacker dorms cheaper and luxury rooms more expensive than this. 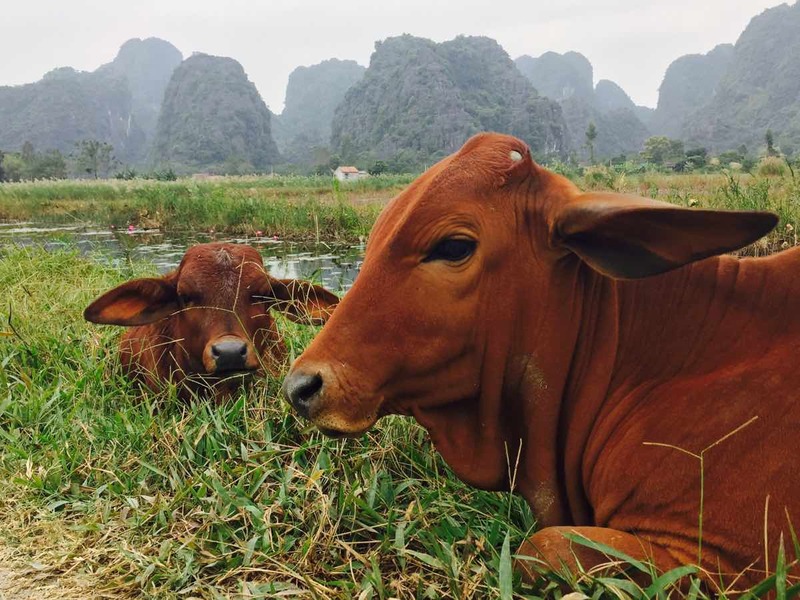 Some of the cute inhabitants of Ninh Binh. Take your time to unwind. A day trip is not enough to truly feel the essence of Ninh Binh. Try to stay a couple of nights and don’t rush your daily activities! Make sure you bring enough money. There are no ATMs in Tam Coc. If you’re staying there and in need of cash, you’ll need to go to Ninh Binh city (7km away) to withdraw money. Keep your calm when driving! Vietnamese can be a bit crazy on the road and if you hear a lot of honks, you’re not doing anything wrong. They just like to announce their presence to everyone. I’ll say it straight away: Ninh Binh is one of the most underrated places I’ve been. 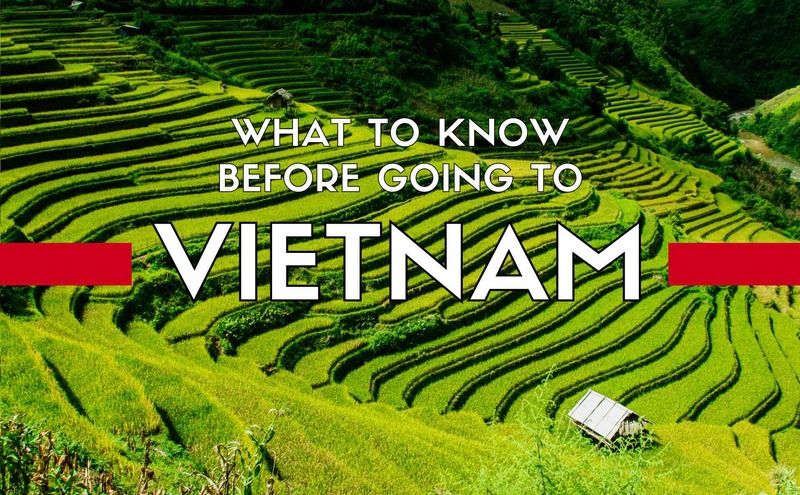 There aren’t many people talking about it and even I only decided to include 2,5 days of it on my Vietnam itinerary as a last minute decision. It totally exceeded my expectations. The region boasts a breathtaking, sometimes surreal, landscape. The Karst limestone scenery is truly a wonder and always present as a backdrop on everywhere you go. The best I can describe it is like I was trapped inside a National Geographic documentary all the time. But this is just the pretty package. What I liked the most about Ninh Binh however was what I discovered inside: authenticity. For some days, you don’t have to face the hectic streets of Saigon, the vendors in Hanoi or the the massive crowds in Halong Bay. 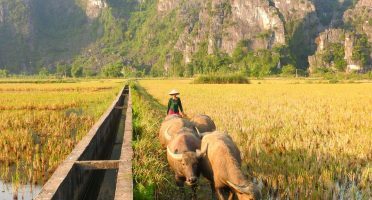 It’s all about the peaceful rural and real Vietnam, the one I wanted to find in the first place when I booked my flight. I can see this dormant state quickly shift and Ninh Binh become a powerhouse as a travel destination in the upcoming years. Somehow it already is amongst some Asian tourists, but I’m sure the hype will spread to the rest of the world. The potential is all there. What’s your favorite place in Vietnam? How was your experience in Ninh Binh?